During my internship, I made a canopy cover for a baby car seat carrier. This was my solution to covering the back window in a one handed motion. I was lucky enough to collaborate with Jennifer Lehner with her Senior Project. Her collection of dresses all used black Sophie Hallette lace. 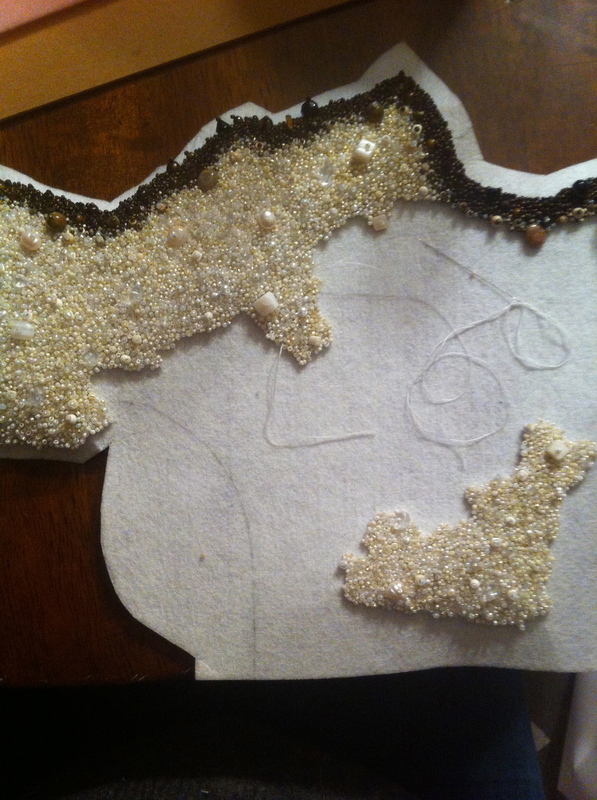 My job was to make the lace stand out by stitching beads and sequins onto the piece to accent them. WE were lucky enough to be selected to show in the SCAD Fashion Show. This backpack was one of my favorite projects. This is because I was able to learn how to use the vacuum former and the project overall reflected a personal memory from my childhood. I searched all over town for the perfect globe, sphere or mold to as my vacuum form structure. I settled on a pottery mold that I found online and created a vacuum formed half sphere to use as my bubble. I experimented with multiple materials and eventually created what I was looking for. The construction of the bag was overall a fun experience. I learned a lot and was happy with the outcome. I collaborated with Nicholas Baker and created a Wind Sculpture for the SCAD Sand Arts Festival. The festival is something that SCAD hosts annually allowing SCAD students and alumni to create a sand castle in 8 hours on the beach or you may submit a wind sculpture. The Wind Sculpture we created was a traditional wind turbine but on a greater scale. I designed and created the sails, while Nick built the structure. Overall it was a success and won 2nd place over all. While I was beading the Bubblegum bag, I had to sand down some of my beads with a Dremel so that they would lay flat on the surface. These beads were vintage beads that I found on an online retail shop. 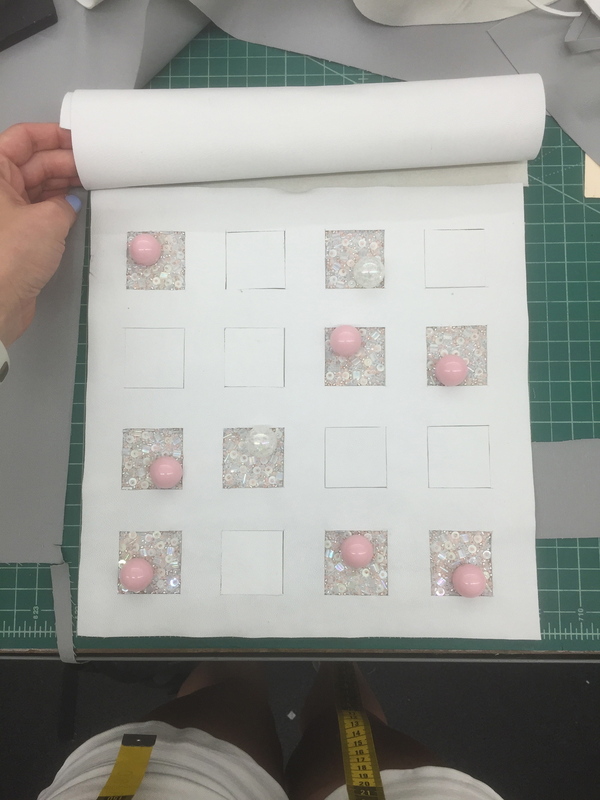 Then I individually sewed the large beads on, along with the sequins and smaller beads to fill in the boxes on the surface of the bag. This winter quarter I am taking intro to industrial design. Our first project required us to make shoes completely out of paper and wear them to class. I used my fibers skills and combined weaving, beading and spinning to create my shoes. The finish product will be posted soon. In my new beading and embellishment class I am beading a belt that is "The Very Hungry Caterpillar" inspired. I will be posting the final product soon! Working Class Studio Presentation of Adult/Child Baking Set. The set includes an adult apron (with wave repeat), a child's apron (with whale graphic) and a set of four wildlife inspired cookie cutters. The aprons were screen printed onto muslim. We learned screen printing in our internship for Working Class Studios! What an amazing technique. In my Images on Fabric class we are exploring the use of acid dyes on different cellulose fabric. By practicing on these samples I am learning how to mix colors, how color reacts to different fabric, and the overall process of painting on fabric. Here is a sneak peek to some new greeting cards I am working on. I am making stamps out of produce like, apples, oranges, grapefruit, onions, peppers, kiwi and more. Each stationary kit will have a different fruit or vegetable. Look out for my handmade fruit and vegetable cards coming your way soon. Over the past few weeks I have been helping a senior fashion student bead a collection of five wedding dresses. Here is a sneak peak of the part I am beading now for her, I hope you guys enjoy. I will be posting the dresses in a few weeks!! Hey guys! This repeat was done for a color theory project. I went ahead and attached a time-lapse so you could see how I use watercolor on the lightbox. I hope you enjoy!